I've been looking to do a retro review of this box set for a while. I finally had the opportunity this time around. This four CD set features an intriguing array of musicians and acts. That said, there is a lot of material here that comes in one way or another from Billy Sherwood. A number of the pieces come from either the Fusion Syndicate album or the Prog Collective set. This whole thing holds together pretty well across all four CDs. It's a great way to sample a pretty wide variety of releases. I should mention that since I've previously reviewed quite a few of the original albums, I've used or modified the original track reviews for use here for the sake of consistency. There is a storm sound on this that I don't remember on the original recording - or at least as pronounced. The guitar rises up with the familiar riff. The vocals join in echoey magic. Violin brings the world music concepts. This song is such a great tune in any form, and I like this mix quite a bit. I think I prefer the original, but this is quite good. The jam later in the track with its saxophone and other elements works really well. They bring it back into a vocal treatment from there with a soaring element. As it evolves further outward there is some rather tribal percussion behind the space music. There are some vocals later in the track that are distorted to sound almost like Daleks. I don't remember that on the original. This is a real powerhouse and a great way to start the set in style. Coming in trippy with winds and odd synthesizer bits, this gets more percussive as it works forward. After a short excursion into trippy weirdness with some odd laughter and such, this launches out into more of a psychedelic rock jam. It reminds me a lot of something War would have done in the 1970s. Yet there are hints of space rock and other trippy elements here. A definite “classic Hawkwind space rock” description holds completely true. I really like some of the sounds on this one quite a bit. The chorus is particularly accessible, too. A major reworking of a Beatles song, this track was recorded on Top Gear with John Peel on January 12th, 1969. Featuring an extended jam intro, which includes a couple bars of "Day Tripper," the Yes version makes for a very interesting take on this tune. This version is really a guitar showcase in many ways and features much extended jamming not present in either of the other performances. The sound on both of these renditions is a bit more raw than the original, and really, that makes for a nice change of pace. The opening on this is sort of trademark Larry Fast, sounding a lot like Synergy. The cut works to more rocking territory, feeling a lot like Billy Sherwood stuff. Of course, he wrote the song, and I'm sure does a lot on it, so that's not surprising. This is a cool track that has a good balance between faster moving stuff and slower. The vocal arrangement is often dense with multiple layers of voices coming in all over this. There are some great changes and varied movements. There is a definite Yes-like element to this, but you can almost expect that when you know Sherwood is involved with it. The title track is a fairly massive and expansive progressive rock jam. The chorus hook is pretty accessible. Overall, this track is one of the strongest on its original album. While it’s got plenty of change and variation, somehow it’s very catchy and cohesive. Just to clarify, this is technically Geoff Tate's Queensrÿche. At least it's the band that went by that name for a while. This is not the version of Queensrÿche that continues to use the name legally. At the time this was recorded, the naming was a contentions issue that was eventually resolved in court. Intricate acoustic guitar brings this into being. Tate's voice come in over the top of that backdrop. It gets a bit more electrified as it drives forward. It gets more metallic with each iteration. It manages to rock quite well as it continues. I would say that this is closer to metal than it is prog, but there are still prog elements here, particularly on the mellower movements. As it moves on later it over-stays its welcome a bit. Additionally, some of the guitar work seems a bit aimless. While this is an instrumental, there is a full vocal treatment of the track on the Prog Collective album. That one also features both Gary Green and Tony Kaye, as well. I have to think that this is literally an instrumental mix of the tune that was featured on that album. This comes in with an almost King Crimson like movement. It works out toward a more mainstream prog jam from there before dropping to an acoustic guitar driven motif. This grows out to a full prog movement as it continues. There are a lot of Yes-like elements and changes here. This is a classy tune with or without vocals. It is dynamic and diverse and works back down to acoustic guitar again later in the piece. A keyboard meets acoustic guitar approach serves as the introduction to this track. This grows gradually until it gives way to a harder edged jam that is both retro and modern at the same time. A funk meets Chris Squire bass approach (calling to mind the Drama album a bit) takes over. The vocals come in over the top of this to carry the cut forward. They move this through some soaring Yes-like changes creating a great progressive rock jam. There is a great angular shift later in the tune that gives way to a short guitar solo segment. The changes continue in an organic fashion, and this thing just plain rocks. A number of intriguing changes and varying instrumental solos take it in different directions, but the bass continues to drive this bus along the winding roads. They shift into mysterious territory later in the cut. Then it moves back out gradually and some Steve Howe-like guitar surges over the top of this in places. I can’t imagine a better way to lead the disc off. This is catchy and yet challenging, the vocal interplay and instrumental progressions are just plain top notch. They show that they know when to soar and when to drop it back, but they also remember that the song is always the king. In some ways this title track seems a bit sparse in terms of its arrangement. That said, it’s somehow quite accessible in some ways. This is another great song. There are some almost Beatles-like moments in the arrangement here. It’s also got some awesome guitar courtesy of Steve Vai. This cut is a bit short of three and a half minutes long. Trippy space brings it into being. It powers out from there with an almost Hawkwind-like vibe to it. In fact, this instrumental very much feels like something that would have fit well on the Hall of the Mountain Grill album. Starting with piano, there is definitive old school Nektar sound to this cut. It's unmistakable as that band and works through some great shifts and turns. It is quite energetic, but also mellow and contemplative at times. There is an interesting trivia point about this particular song. It was played on episode of "The Jeffersons" television show. Sherman Hemsley was a huge Nektar fan, and is shown getting down to it. There is some killer jazz built into this rocking number. This is very much a fusion piece and it has some great dynamic range and diversity. There is some particularly intriguing guitar work. When you've got Steve Morse handling the string box, though, what do you expect? You definitely can't discount the horns or the piano on this either. Both are great. Psychedelia and space rock merge on this killer tune. It's closely related to stoner rock. I like this band quite a bit, and this is a great example of why. It's just such a tasty groove. A sitar driven section takes it into full psychedelia at the end. With a mellow and rather spacey introduction, this powers into some trademark Billy Sherwood stuff as it moves forward. There are some particularly powerful moments here. This has some killer guitar work, and the whole piece is just packed full of prog rock goodness. I love the vocals on this cut. The tune has a great prog rock turned AOR vibe to it. This is accessible, but also quite meaty at the same time. This is another that is obviously written and produced by Billy Sherwood to anyone who is familiar with his work. It's also at his usual level of quality. Coming from the Fusion Syndicate album, this features both Rick Wakeman and Billy Sherwood. It is very much the kind of thing that one expects from Sherwood, really. Wakeman gets a chance to really shine mid-track. Sherwood’s guitar sound is impeccable. Of course, Goodman’s violin is also classy as always. Nik Turner provides some saxophone to the piece, as well. There are definitely plenty of elements of the kind of fusion Goodman did with Mahavishnu Orchestra. There is a bit of bombast at the start, but it drops to a sparse percussive bit from there. It grows outward to a slow moving symphonic prog arrangement from there. Then is that drops to that percussive thing for the rather creepy folk prog vocal arrangement. The cut builds outward in quite a theatrical arrangement. This thing gets into some particularly powerful symphonic progressive rock jamming as it continues to drive forward. This has some pretty awe-inspiring moments. All of the cool music is surrounded by pirate based lyrics. This is such a killer cut, really. Colin Moulding, Rick Wakeman, Steve Hillage & Mel Collins - Are We to Believe? I love the talk box guitar on this high energy prog tune. Of course, Wakeman puts in some exceptional soloing, too. This, in many ways, really does feel like a cross between the work of Wakeman and Billy Sherwood’s sound. That’s a great combination, really. The saxophone solo is a great touch. This is another instrumental. It has some cool shifts and changes and occupies a space somewhere between Yes-like prog and fusion. I may well have already reviewed this track, as I have reviewed some live versions of this cut, but I can't be sure this is the same one. This rocking number is part psychedelic rock (think "Jefferson Airplane"), part prog rock and all cool. I love some of this killer instrumental work here, and the whole driving arrangement is so cool. 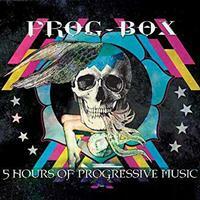 This comes from the Prog Collective disc. As you can guess by the artist who gets the credit here, Nektar’s Roye Albrighton provides the vocals. This is one of the coolest cuts of the disc. In part that’s because it seems a bit different than the rest of the stuff. Nektar would be a good musical reference, but Pink Floyd also seems valid. This is more of a spacey tune in a lot of ways. I really love the awesome jam later in the piece. I love the spacey keyboard textures that start this. It's so trippy. It is also rather creepy. I could see using this as music in a space based horror film. It's electronic and unsettling. It's dramatic, too. Keyboards and atmosphere with sound bites from space missions opens this. Eventually it powers out to a killer Hawkwind like space rock jam. There’s a smoking hot jam after the mid-track where Turner blows the saxophone as space keyboards wash over a driving rhythm section. A tribute to a four-legged furry friend, as a dog lover I can sure relate. This is quite slow and mellow. It’s also quite magical. The guitar solo section on this one is particularly noteworthy. Of course, it’s Al Di Meola, one of the greatest guitarists on Earth, so that makes sense. With John Wetton on lead vocals, Derek Sherinian providing keyboards and John Wesley on guitar, this song is mellower than the opener. It’s got more of an adventurous arrangement, too. There are a lot of very stripped back sections. It’s still got hints of Yes; Open Your Eyes-era sound, but overall this is more of a pure progressive rock than a mainstream prog type piece. The recording on this seems a bit noisy and dirty. The cut is a bluesy rocker that's cool. Langton is probably best known for his tenure in Hawkwind, but he did a lot of other things over the years, too. This comes from the Prog Collective album. Nik Turner does the flute and saxophone on this piece while Billy Sherwood himself handles the lead vocals. The killer retro sounding keyboard solo on this one is provided by Geoff Downes. There are some great moments here. It’s a fairly fast paced progressive rock jam that’s very effective. Coming from The Fusion Syndicate album, there’s an awesome bass groove leading this off, and they launch out into a jam that’s so strong. This time around the lineup is Larry Coryell, Derek Sherinian, Eric Marienthal, Chick Corea and Chester Thompson. There is some awesome and purely crazed jamming in this thing. It’s angular but still manages to groove. There’s a cool 1960s styled groove to this piece. This thing continues with some killer retro jamming. The female vocals are basically spoken and sort of distant in the arrangement. This might well be guitarist Peter Banks’ last recording. He was the original guitarist for Yes, and he passed away shortly after playing on this song. It is a rather Yes-like song and that’s appropriate. It has some really dramatic moments. Sonja Kristina is the singer here. Larry Fast provides the keyboard solos. This is a good tribute to Banks. There are several shifts and changes along this musical road. I really like the rather melodic almost jazzy mellower movement later in the piece. I also like how they take that out into somewhat noisy space for a short time. This has a real Billy Sherwood sound in the song construction and production. Rick Wakeman’s keyboard soloing, though, is unmistakable. I love the guitar sounds on this thing, too. I like the rhythmic element to this piece a lot. It’s a cool tune that works well and has some great horn playing. The lineup here includes Steve Hillage, Scott Kinsey, Theo Travis, Justin Chancellor and Asaf Sirkis. There are some moments here that have some scorching soloing, and yet there are also some smooth horn based sections in the midst. Here we get a roughly ten-minute version of the classic Nektar song. I reviewed this on one of the reissues of the album, but didn't really say much since it was essentially a revisit on that disc. The familiar guitar textures rise up, and the cut works out into a classic prog jam. Remember the Future is one of my favorites from Nektar, so I really appreciate this. In a lot of ways this manages to encapsulate a lot of the best bits from the major epic (this song took up both sides of the original vinyl album), really capturing a lot of the magic of the full thing. I've always loved the balance between rocking stuff and more evocative mellower sounds on this piece. They don't sacrifice any of it in this shortened take. I think that perhaps this is the "gateway" to the album in a lot of ways. It has much of the killer instrumental work, the vocal passages and the general concept of the epic, but without the same amount of time required to digest it. This is really one of the highlights of this entire box set for me. I love the bass groove here, but then again, it is Billy Sheehan. There’s some soaring guitar playing on this, and we’re taken through a number of awesome variants on the piece.. This is one of the most adventurous cuts on the original Fusion Syndicate disc and one of my favorites on that set. I like every bit of it a lot. Everyone seems to find the opportunity to shine, yet the flow and melody never suffer for it. Trippy electronics are on display in this number. It's a keyboard based bit of weirdness that does feel like a computer. This an alternate take on a number that was included on The Prog Collective's album. It has a high energy prog vibe to it that bears the trademarks of Billy Sherwood. I really love some of the keyboard work on this, but the acoustic guitar is classic, too. Everything here really works well, and the whole tune has a lot of Yes elements at play. This is an instrumental version of a song that came from the Prog Collective album. It has some killer prog rock stylings built into it. It works through some interesting shifts and changes, and is another that's distinctly Sherwood like. This is a relatively short number at just under two and a half minutes. The vocals on the original album were provided by William Shatner. Another cut from the Prog Collective album, this rocks out pretty well. It’s fast paced and runs between something that’s almost metallic and more Yes-like progressive rock. Steve Morse handles the lead guitar while his former Dregs bandmate Jordan Rudess plays the keys. Fee Waybill provides the lead vocals. This is powerful and rather catchy. There is a drop back to a mellower section later in the song. I really love the almost space rock styled instrumental movement later. The bass line on this is also particularly noteworthy. There are really some great moments built into this tune.